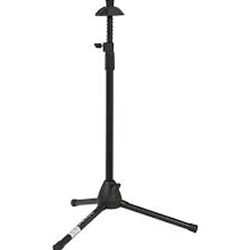 The Hamilton trombone stands are designed to last and, more importantly, to support your trombone reliably. The Hamilton engineers created the proper counter balance needed to support your trombone efficiently and safely. Wide base for extra stability; bell rest with spring cushion; legs fold for easy transport; black painted finish with plastic protective feet.